Better Generator for Stocks and Crypto Currencies. Forex Forum → Expert Advisor Studio → Better Generator for Stocks and Crypto Currencies. Topic: Better Generator for Stocks and Crypto Currencies. The newest version of EA Studio works better for assets with big prices. It does that by automatically adjusting the indicators Level ranges according to the currently loaded market data. It resets and re-calculates the ranges every time you run the Generator in order to be sure the values are meaningful. Re: Better Generator for Stocks and Crypto Currencies. For the ones that didn't notice EAS now has also "Point Value" in the Data Export Script. Now you can backtest symbols that have different point value. Eg. Corn Futures, Live Cattle Futures, etc. Thank you for listening to the community. I believe many others like me who trade stocks and commotities will be very happy with those two news, and more new users to come in the long run, as the software is now an universal automatic strategy generator that can be fit in any market (not only for forex symbols). Great news Popov, the EAS get better and better. I wonder if it's just me or not. It must be OK now. This is fantastic. I am loving EAS. I just started demoing some strategies that were created with the generator for some of the indicies and cryptocurrencies available for me to trade through my broker. So thankful for this software as it is really helping me with my trading where I don't have to sit and watch charts all day. May I know where could we download this new 'Data Export Script' that have the 'Point Value'? The 'Data Import' page that we could download the 'Data Export Script' is v3.3, it does not seems to have the 'Point Value'. 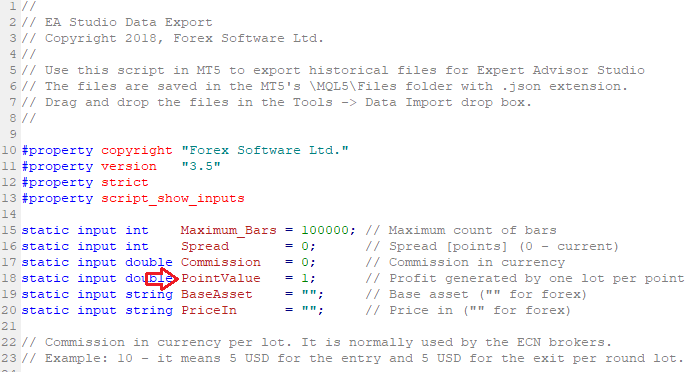 Hello sbpro, you can find it for .mq5 script only at "EA Studio > Tools > Data > Data Import > MetaTrader 5: EA Studio Data Export.mq5"
The "Point Value" will be on the line 18 of the script. So, why there is no such script for MT4 ? I mean it's not updated yet.